Perhaps the most alarming of Inveraray’s quintet of ghosts is to be found in the MacArthur Room. The legend goes that in 1644, the Duke of Argyll fled his castle to escape capture from the Marquess of Montrose. When he deserted, he left behind a young Irish boy who had been in his employment as a harpist. Upon being discovered by Montrose’s men, the youthful musician might have wished that he had fled alongside his master. The Marquess had deployed Irish mercenaries who, outraged that a fellow countryman could be in the employ of their sworn enemy, slaughtered the boy, leaving his dismembered body on the duke’s bed. Despite this gruesome and bloody scene having taken place in the old castle, so attached is the boy said to have become to the bed, he stayed with it even when it was moved to the modern castle. It is said when a member of the family is about to die in the castle, harp music can be heard coming from this room. The last report of this ghostly phenomenon was when the 10th Duke died in 1949. Elsewhere in the house, a bagpiper has been heard playing on the balcony of the Brown Library, and when Most Haunted visited the castle a book of poetry was thrown from this same spot. However, in the Old Kitchen, a more cheery spirit in the form of a laundry maid has been heard laughing hysterically on a number of occasions. A ghost known as the Grey Lady and a spectral soldier have been reputedly spotted making their way around historic Ruthin Castle, once owned by King Edward I, Henry VIII and Elizabeth I. Visitors can now stay in the castle’s eclectic selection of rooms, many of which have been styled in dedication to some of the noteworthy figures who have stayed at the property over the years, including Lady Randolph Churchill, mother of Sir Winston Churchill; actress, Lillie Langtry; and leading Edwardian playwright, Oscar Wilde. Just keep an ear out for the sounds of ghostly footsteps and unexplained sudden drops in temperature. 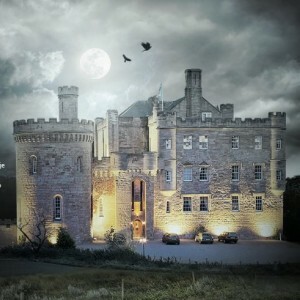 This 13th century castle hotel comes complete with acres of wooded parkland and its very own paranormal resident. The spirit in question is thought to be Lady Catherine who occupied the castle in the early 18th century and has more recently been reported to haunt the castle’s stairs, dungeon and corridors. Those staying at the castle might catch a glimpse of Lady Catherine’s ghost or hear her tapping on various doors. The hotel’s 29 bedrooms are decorated in swathes of Scottish fabrics, including tweed and tartan while period furniture adds to the warm and welcoming interiors. Founded by Cistercian monks in the 12th century, this former abbey has a long, fascinating history that has even seen it used as the home of royalty. Transformed into a stunning hotel in the 1990s, guests can enjoy taking a stroll through the 500 acres of parkland and formal gardens before retiring to elegantly-decorated rooms complete with rich colours, period furnishings and (in some rooms) some of the grandest four-poster beds you’re likely to find. In the 18th century, Longleat was home to Louisa Carteret and her husband, Thomas Thynne, the 2nd Viscount Weymouth. The match was ill-fated; she was considered kind and beautiful, while he was bad-tempered and suspicious – the latter tendency exacerbated when it was suggested to him that Louisa’s relationship with one of the footman may not have been entirely innocent. Enraged, he attacked the servant, fatally pushing him downstairs and concealing his body beneath the flagstones in the basement, insisting later to his wife that the man had simply departed suddenly. A distraught Louisa caught a chill and died, aged 22, in childbirth in 1736, after which servants reported seeing her prowling the corridors, apparently in search of her footman. To this day, she is heard banging on doors, trying to unearth the mystery – a mystery to which the house holds the key, for when central heating was installed at Longleat, a body was indeed found beneath the flagstones, clad in 18th century clothing.